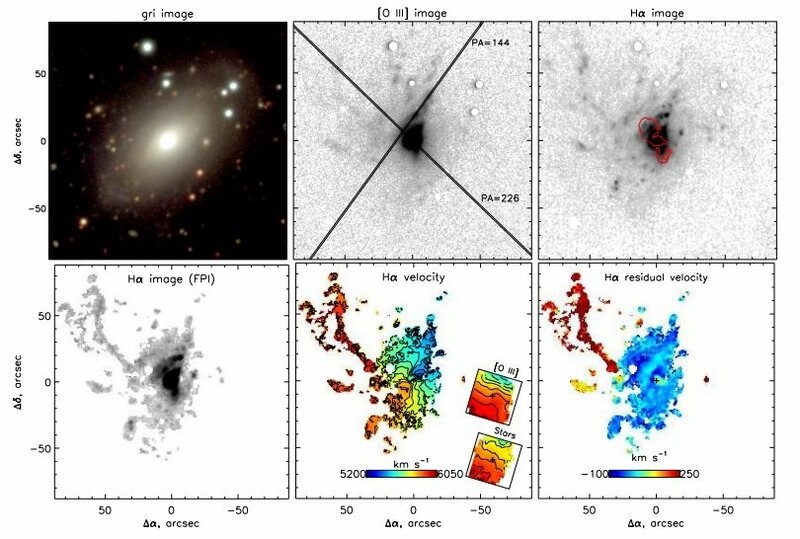 Russian astronomers have conducted a study of large-scale morphology and kinematics of the ionized gas in the galaxy Markarian 6. The research, in addition to mapping the ionized gas in the stellar disc, has identified a system of faint, extended emission filaments in the galaxy. The finding is detailed in a paper published September 16 on the arXiv pre-print server. Markarian 6 (or Mrk 6 for short) is a Seyfert galaxy located some 263 million light years away. The galaxy showcases complex radio emission structure consisting of a compact radio core and elongated multicomponent radio structures resembling jet elements or hot spots. Mrk 6 also exhibits complex kinematics of ionized gas, which is still not fully understood. In order to learn more about this subject, as well as to better understand Mrk 6's morphology, a team of astronomers led by Aleksandrina Smirnova from the Special Astrophysical Observatory of the Russian Academy of Sciences (SAO RAS) in Nizhny Arkhyz, Russia, has conducted 3-D spectroscopic observations of this galaxy. For their observational campaign, the researchers used the six-meter SAO RAS telescope and the one-meter Schmidt telescope at the Byurakan Astrophysical Observatory (BAO) in Armenia. Their observations were complemented by archival data provided by the Multi-Pupil Field Spectrograph (MPFS) mounted on six-meter SAO RAS telescope. 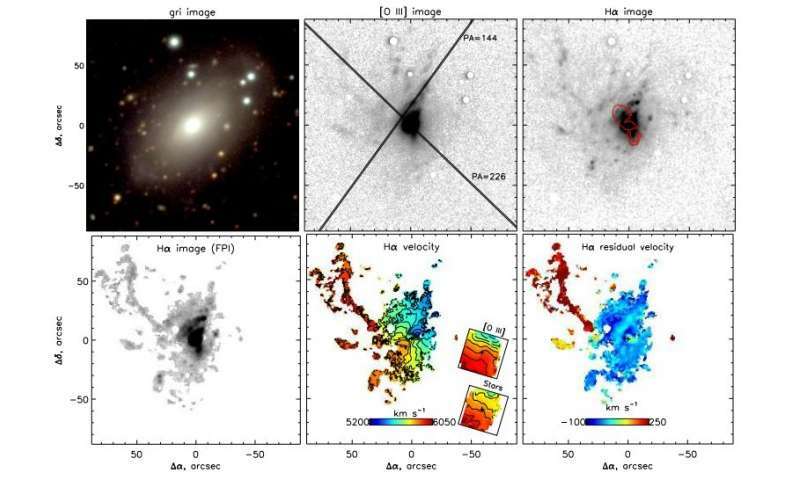 "Using various techniques of optical observations at the six-meter Russian telescope (emission-line images, long-slit and 3-D spectroscopy), we have studied large-scale morphology and kinematics of the ionized gas in the Seyfert galaxy Mrk 6," the astronomers wrote in the paper. Besides providing essential information about the ionized gas in Mrk 6's stellar disc, the observations resulted in unveiling the presence of a complex structure of the Extended Emission-Line Regions (EELRs) in Mrk 6 consisting of a gaseous disc co-rotating with the galaxy's stellar disc and off-plane ionizing filaments. The structure extends to a projected distance of about 130,000 light years. The origin of the extended emission filaments in Mrk 6 remains uncertain. The researchers suppose that they were formed by an external matter orbiting orthogonally to the stellar disc. This could mean that origin of the filaments in Mrk 6 is similar to that in gaseous clouds in tidal tails and debris caught in the ionization cone of the active galactic nucleus (AGN). "Kinematics as well as an ionization state of the filament gas suggest the scenario that hard radiation of the active nucleus illuminated the matter accreted from outside and orbiting almost orthogonally to the Mrk 6 stellar disc," the paper reads. However, the astronomers added that a possible source of gas accretion is still unknown. They that new deep neutral atomic hydrogen radio observations of Mrk 6 will make it possible to reveal a clear picture of the gaseous environment and accretion processes.